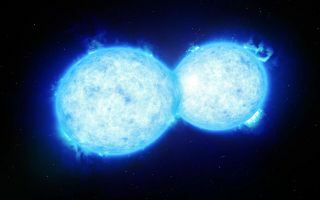 An artist's impression of the hottest and most massive contact binary system, where the two similarly sized stars share material. Unlike their cousins, "vampire binaries," which have one smaller star sucking material from its larger neighbor, VFTS 352 contains two stars of almost identical size. Instead of one star stealing material from the other, the pair may share as much as 30 percent of their components.